The mango is a large fruit that grows on trees in sub-tropical and tropical climates. Originating in Southeast Asia, where it has been cultivated for 4,000 years. Mango trees are actually evergreens that will grow up to 60 feet tall but fruit an average of 5 years after planting. Mango trees yield the best crops during hot, dry periods. The U.S. imports most of its mangos from Mexico, Haiti, the Caribbean and South America but grows them in Florida as well. You’ll find mangos in the produce section of your grocery store. Choose mangos that are slightly firm, blemish-free with a sweet aroma and no sap on the skin. After storing at room temperature for 1 to 2 days, store cut up, peeled mango in the refrigerator. You may not know that: there are over 1,000 different varieties of mango worldwide and, according to the Centers for Disease Control and Prevention, mangos are the most widely consumed fruit in the world!! Depending upon the time of year, you can usually find one of six mango tropical fruit varieties available for purchase in the U.S. They are ‘in-season’ in spring. The most widely available commercial variety in the U.S. is the ‘Tommy Atkins’ mango which is available from March – July and October – January. In June look for other varieties, including the Ataulfo, Haden, Francis and Kent mangos. 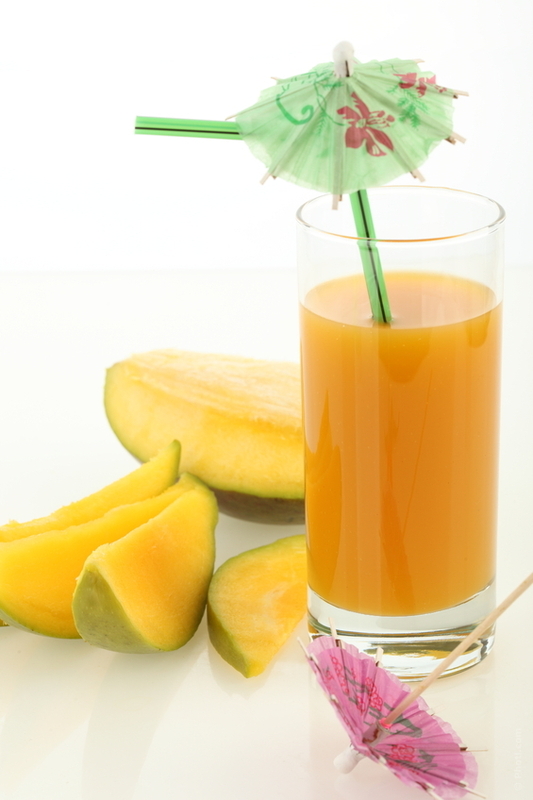 Mangos, like another tropical fruit, the papaya, contains unique enzymes that aid in proper digestion. The enzymes in unripe (green) and ripe mangos are very good tenderizing agents. Mangos are an excellent ingredient addition to any meat marinade recipe. In fact, in India, a sour powder which contains ground up green mango, is used for seasoning and tenderizing. One cup of sliced, raw mango (without skin) offers 107 calories, 0 g fat, 1 g protein, 28 g carbohydrate, 24 g sugars, 3 g dietary fiber and 3 mg sodium. Mangos have a very distinctive, sweet flavor and a yellow-orange flesh. It is an excellent source of vitamin C. One cup of slice, raw mango provides 45.7 mg vitamin C, meeting 3/4 of the average daily requirement for this nutrient. This fruit is also an excellent source of vitamin A (in the form of beta-carotene), meeting 25% of the recommended daily value. Vitamins A and C act as antioxidants, protecting your body’s cells from free radical damage and giving your immune system a boost. Mangos are a good source of the trace mineral copper, which, along with vitamin C, is needed to form collagen and, along with iron, form hemoglobin to transport oxygen throughout the body. Eat mango fresh or peel, cut and freeze it (or purchase it in frozen chunks) to use in smoothies. Because they are so sweet, they work well in any smoothie, especially green smoothie recipes to off-set the bitterness of leafy greens. If you’ve got a high-powered blender, try this green smoothie recipe (no measurements, a ‘handful’ works but use your judgement and taste buds for portions): layer, in order: green grapes and/or watermelon; fresh baby spinach, one carrot, 1/4 apple, 1/4 to 1/2 avocado, 1/2 cup plain yogurt, a handful of frozen pineapple chunks and mango chunks and a splash of coconut milk, soy milk or regular skim milk (may or may not wish to add a squeeze of honey). Blend well and enjoy! Mangos pair well with poultry and work in marinades, on salads, in fish tacos, chutney, salsa and on skewers with pork or shrimp for fun dinners. Try this mango coconut rice recipe. You can even use mangos to prepare fun, tasty alcoholic and non-alcoholic drinks or sweet and savory salsa and chutney. If you love mango juice, don’t buy it bottled but make it fresh to reap greater health benefits and better flavor. That way, you can control the sugar content – remember, you don’t need much as mangos are so sweet.